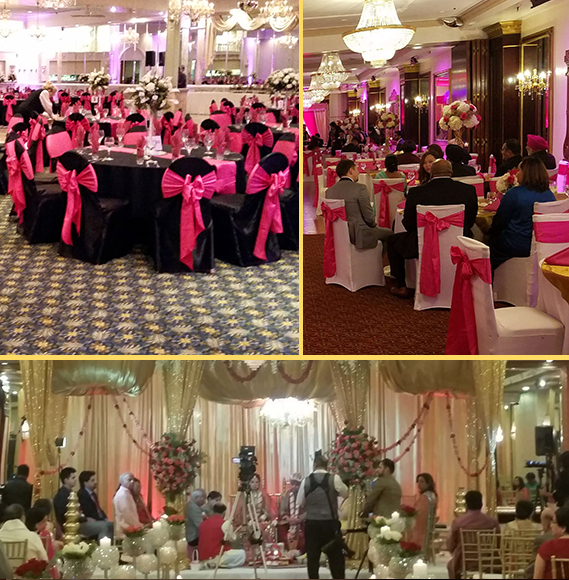 Host your wedding reception at Antun’s by Minar, and allow us to make your wedding day an unforgettable one. We will provide you with an exquisite choice of rooms to host your dream wedding and give your guests an unparalleled experience. Ask us about our Ballroom Suite, Lux Room, and Hamilton Suite. Our representatives will gladly take you through all of the different options for your wedding which we can provide, taking into account the style and size of your wedding reception. Our magnificent rooms can be transformed into the venues of your dreams and allow you and your guests a truly once in a lifetime wedding experience. Feel the elegance of our dramatic lobby staircase as you and your guests arrive at your reception on your special day. We can provide a large variety of menus including unforgettable South Asian, Spanish, and Italian dishes. Our staff will work with you to customize your event’s menus to specifically fit your desires. Contact us today to speak with one of our wedding reception specialists and begin planning your event.